The resilient city has risen from the rubble even cooler than before. In the five years since the quakes, Christchurch has truly risen from the rubble. The city is enjoying a renaissance thanks to the resourcefulness of residents who’ve not only bounced back from disaster but injected new life into every brightly-coloured brick. Here’s our top ten highlights for the resilient city. ‘EVERYTHING IS GOING TO BE ALRIGHT’ reads artist Martin Creed’s 46 metre long work of neon, shining a permanent message of hope into the Christchurch sky. The city’s latest public artwork commemorates the reopening of the gallery last December after five years of construction work to repair and expand the building following the quakes. Creed, famous for his Turner Prize winning work “The lights going on and off” joins a permanent collection including the sculptures of Michael Parekowhai and florescent art by Bill Culbert. 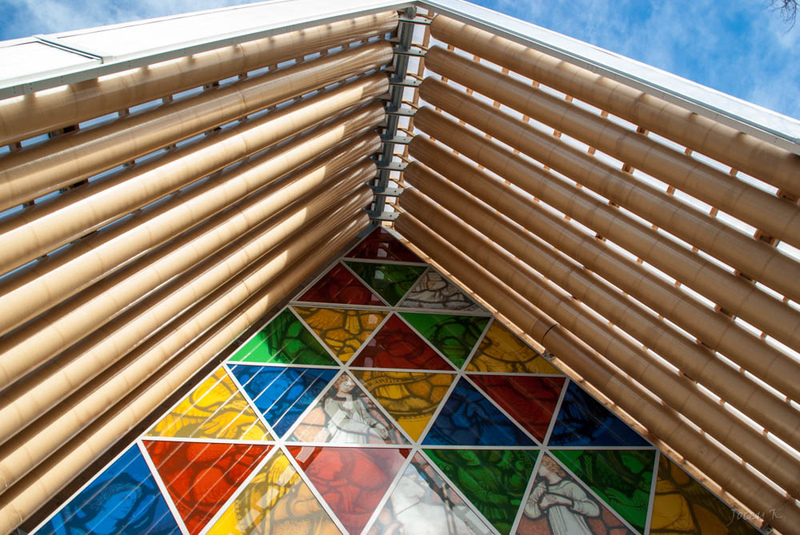 After the loss of the original Christchurch Cathedral, starchitect Shigeru Ban stepped in to design this stunning transitional replacement out of cardboard. The 700 seat structure is built from giant 24 metre high cardboard tubes which rise out of shipping container walls. What do you do with a city full of empty bulldozed commercial sites? Plant some seeds! Greening the Rubble are a group of volunteers that are rejuvenating Christchurch by creating temporary public parks on earthquake hit sites. Their latest project The Restless Forest combines landscape, art, and story-telling using native plants that move through different parts of the city. Several of Christchurch’s eastern suburbs became an uninhabitable red zone following the quakes. As thousands of homes were demolished, only their trees and shrubs remained, left to grow out into a wild urban forest. Otautahi Urban Foraging have created a map of over 1800 forageable fruit and nut trees including 500 apple trees, 340 peach trees and 240 feijoas. Foragers enjoying the giant orchard post pics of their finds and give gifts of red zone jam and fruit pies. April 2 sees giant Hagley Park in the city centre taken over by a host of local breweries for the annual Great Kiwi Beer Festival. Featuring tastings from hundreds of Kiwi and international craft beers, the festival is a chance for beer hounds to interact with their favourite brewers. Keep your eyes peeled for fabled Unicorn APA from local heroes Fiasco Brewing Company. The loss of iconic venue Dux de Lux at Christchurch Arts Centre broke hearts and shattered the live music scene. Thankfully you can never keep a good pub down for long. Like a boozy hydra, chop off one head from this beast and three more pop up in it’s place. Music venue Dux Live in Addington plays host to both international artists and the loudest local reggae soundsystems. Dux Dine in Riccarton is a historic villa turned turned into an award wining seafood restaurant. Multi-storey Dux Central in the CBD is home to 180 beers including the famous Dux house beer Ginger Tom. This pile of shiny lego began life as a temporary space for the dozens of retailers who had lost their premises in the city. After becoming a local icon it packed up and was moved by crane to permanent premises at 114 Cashel Street. Be sure to check out local mainstays Scorpio Books and independent boutique Infinite Definite before nomming down on some Tiki Taco. What happens when you give a beer fanatic with a brewing degree his own space? A library of beer complete with a “reading room” for beer and cheese tastings, that’s what! The library features the largest selection of local and international craft beers in New Zealand, with a rotating cast of 300 brews. As well as selling by the bottle and can. the library is going easy on both the planet and pocketbook by filling riggers (huge re-usable beer containers) straight from the tap. Those famous Aussie night noodle markets are finally coming to NZ! The crew behind Melbourne’s favourite evening eats will relocate to Hagley Park from February 10 – 14 with live music and dozens of noodle vendors. As a response to the bare open spaces left by the quakes, urban regenerators Gap Fillers are installing lively temporary activities all over the city. Dance-O-Mat is an impromptu disco dance floor where a discarded washing machine has been turned into a bluetooth jukebox for your phone. Meanwhile a school group formed the Piano Shelter Project, delighting travelling pianists who stumble upon tuned up piano pods. Ready to check it all out for yourself? Start your Christchurch adventure with Qantas flights to New Zealand.